The original application was written back in 2001 in Visual Basic 6. It is quite trivial application (despite the fact, that when I first created it being a kid, for me it was not). 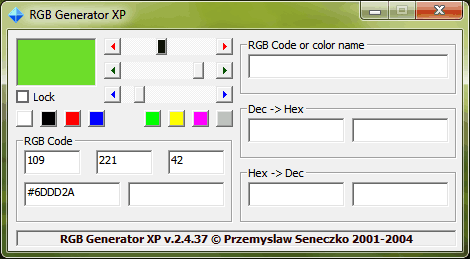 It is intended for easily creating hexadecimal RGB codes using sliders. I know, there are plenty of similar tools, also inform of online apps. HoweverI still like the “mechanics” of the UI and its simplicity. It turns out, that I still need it. However, the originally compiled executable does not work on modern Windows system. I decided to check if it is possible to fix this. I took my Visual Basic 6 installation CD, started snapshotted virtual machine running Windows XP and opened source project files. The application had simple HTML editor and used a few really esoteric OCX controls. In fact, they were not essential for the application’s core functionality. After removing unnecessary references from the project and disabling some of the UI components, I recompiled the source code so that it uses only “out of the box” Visual Basic libraries. The Windows operating system includes Visual Basic 6 runtime DLL even now and finally I managed to run the application on my Windows 7 64-bit machine. Welcome to my main technical blog! Recently I have decided to diverge my concept of blogging. On this blog I will publish all new technical articles only in English. My old blog — pjs.blox.pl still exists, but only less important, Polish-specific articles will be published there. There are several reasons why I decided to build a new blog. Firstly, target audience is incomparably bigger for English content. Secondly, the old platform — blox.pl is real pain in the neck. It has many limitations and it is just inconvenient. Therefore, installing and starting own, decent platform such as WordPress is an obvious choice for any non-amateur writer.